Every last one of us is going to exit this world in a pine box. On the way out the door, we’re very likely to suffer debilitation and pain, often extreme and of long duration. Every single person we love and care about in this world will likewise die. The existence of death and suffering in a religious context has been called the “Problem of Evil.” From what I understand Buddhism teaches that suffering is ultimately an illusion. In Hinduism suffering is deserved because it is the paying off of a karmic debt from bad deeds in a previous life. In Christianity, the dilemma is that if God is all powerful and all good, why hasn’t he put an end to suffering? When we break down the hunger for meaning into more concrete needs, one is for an answer to the problem of suffering and evil. I don’t mean a theodicy; by definition, unbelievers have no place for this. I mean how to live with it. We can be overwhelmed when we are made aware of all the suffering there is in the world; and more than this, the loss, dispersal, evil, blindness; or the distorted and thwarted and self-mutilating humanity; or the dullness, emptiness, flatness. This is, as it were, a condition which arises even in the disenchanted world: we are unprotected; not now from demons and spirits, but from suffering and evil as we sense it raging in the world. There are unguarded moments when we can feel the immense weight of suffering, when we are dragged down by it, or pulled down into despair. Being in contact with war, or famine, or massacre, or pestilence, will press this in on us. But beyond suffering there is evil; for instance, the infliction of suffering, the cruelty, fanaticism, joy, or laughter at the suffering of the victims. And then what is almost worse, the sinking into brutality, the insensible brute violence of the criminal. It’s almost like a nightmare. Modernity has two strands of responses to this. The first is the response to evil and suffering generally, and usually takes the form of the quest to eliminate it. This can produce much good effect when those efforts recognize the inevitability of the human condition. Too often, however, it crosses over into a utopian seeking of the complete elimination of evil and suffering, and by doing so becomes that very evil itself. The 20th century record of movements like Communism attest to this, though this belief that we are on the side of righteousness and thus are justified in anything in our pursuit of what we believe of be justice is something to which we are all susceptible. The second strand is the response to personal suffering. One approach is what I’ll label “mindset.” The idea is that we engage in a thought control process to attempt to reframe suffering into a positive context. We might, for example, think of all the people who have it worse than us so as to make our own suffering seem less. Or we try to recontextualize suffering as a growth experience – “no pain, no gain” or “that which doesn’t kill us makes us stronger.” Pretty much every self-help or self-improvement book I’ve read involves some type of mindset advice. Another attempt to deal with suffering is medication, which can take various forms. This often ends badly when not subject to rigorous external constraint. We are in fact often able to use these techniques to successfully overcome personal suffering. The problem we face is that we can, and often do encounter suffering and events that overwhelm our coping mechanisms. Everyone of us has a breaking point at which our resources for coping with suffering will fail. If it has not happened to you yet, rest assured, it very much could. Some people do survive extreme suffering like the Holocaust, post-nuclear Nagasaki, 9/11, or the horrors of war, but very often they are permanently damaged or scarred by the experience, not made stronger. Don’t believe you’re guaranteed to be different. Being confronted with the limits of your own ability to cope with suffering is one of the themes of Shusako Endo’s novel Silence, which was just released in a film adaptation of the same name by Martin Scorcese. 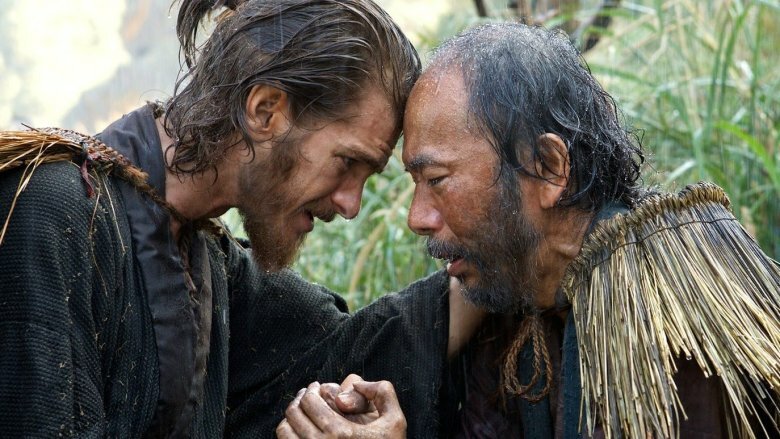 Silence tells the story of two Portuguese Jesuit priests who travel to Japan during a time of persecution in search of their former mentor, who rumor has it apostatized from this faith (i.e, repudiated Christianity). They are fully trained in the Christian theology of persecution, martyrdom, etc., but find they are unprepared for the reality of what they experience. What Endo gets at, and repeatedly obsesses over in all of his writings, is the fate of those who are pushed beyond the normative categories of experience. Martin Scorsese’s script, very faithful to the book, reveals the deeper, artful way of pushing us out of normative categories of experience as well. Endo seems to argue that none of us are exempt from the possibility of complete failure if we face extraordinary torture and dehumanization. Scorsese translates this trauma to a hidden, and therefore more powerful, view of fear. Neither of them discounts the possibility that even in such circumstances one may rise above all the darkness and achieve heroic heights—or true martyrdom. But Endo’s focus is on the weak, those who cannot rise above their fears and whose circumstances expose their inner demise. Given the worst scenario, the most nightmare-filled turn of events, what virtue and faith remain? Endo’s Silence thus explores the essence of the human condition, our weakness and incapacity in the face of the inevitability of the evil and suffering in this world. By exploring this through the lens of the extreme, it allows us to understand the more mundane as well. Not everyone fails only under torture, but often under much more ordinary events: sickness, job loss, divorce, loneliness. It may well be that we have the ability to develop additional capacity to overcome these kinds of experiences, but all of us at any moment are at risk of being hit by the right event that will overwhelm us. Silence takes place around 1640. It’s a fictional story, but takes place in a genuine historical setting and is based on real historical figures. Japan had been globalizing and had opened its ports, particularly Nagasaki, to European traders. Christian missionaries came to the country and converted a large number of people, as many as 300,000. What ensued after Ieyasu’s edict to ban Christianity is one of the darkest periods in the history of the Japanese Christian church. The depth of cruelty, the “refined” design of torture techniques and the prolonged suffering of the faithful rival any time in history, including the early church. The depth of evil—what can only be described as a genius for innovative torture techniques that equaled or even surpassed any modern torture methods—led many Japanese Christians, even the greatest of priests, to recant their faith. Beyond banning Christianity, European contact was greatly restricted for an extended period of time and the Japanese became a closed off society until the famous arrival of Commodore Perry’s black ships in 1853. The novel is set after the persecutions have already largely succeeded. The foreign priests in Japan are either dead, or in the case of Father Ferreira, potentially recanted their faith. The ordinary Japanese Christians have been driven underground. Jesuits priests Sebastian Rodrigues and Francisco Garrpe can’t believe that Ferreira, their mentor in the faith, could ever apostatize. They beg for permission go to Japan, finally finding a way in on a Chinese ship with a strange Japanese guide named Kichijiro, who may or may not be a Christian himself but who is an obviously wounded and haunted person. Kichijiro takes them to a dirt poor village with underground Christians ecstatic to see the priests. They minister to the community and search after news of Ferreira, while being appalled by the conditions in which the Japanese villagers live. I won’t go into many more details on the plot – no major spoilers. You can find the plot summary online for yourself, but ultimately the priests find themselves betrayed and Rodrigues comes into the power of Inoue, the magistrate known for his horrific tortures of Christians. Fearful yet confident in his ability to resist torture, Rodrigues comes face to face with a situation unlike anything he was remotely prepared to deal with. You are put to the test: how much can you take before you crack? How could you judge another person for falling out of grace if, when you haven’t been put to the test? And even if you’ve been put to the test and make it, in a true Christian sense, the Kichijiros have to be accepted to – they have to be “forgiven” by the priests and the people around him. If you’ve ever had a family member or loved one who’s got an addiction of some kind…They clean up and they go back on. What do you do with them? They come back, they’ve cleaned up for a while. Next thing you know they rob the house. They’re back on the stuff. Bail ’em out, you get ’em out again, they bring friends over to rob the house. Then what do you do? It reminds me of when I was about eight years old during the Cold War. The most frightening thing was the image of the POWs who had been brainwashed. Like, their souls were taken away. They came back and they were shunned by society. And was that the right thing to do to them? Where was the compassion? What about their suffering? This, for me, is something that is troubling, and I guess that’s why the material has always been so important to me. Both Endo’s and Scorcese’s versions of Silence are fantastic meditations on the cold reality of the human condition that makes a mockery of our modern assumptions that we can live largely free of suffering and evil in this world. Highly recommended. Is this a sign of a shift in your professional focus from the political and economic to the philosophical and cultural? Very thought provoking…. Thank you. I’m not planning any wholesale pivot in what I publish here, but I am going to broaden my coverage areas to talk about more non-urbanism things I find of interest. Thanks, Aaron. I read the book years ago, and have not yet found the heart to see the film.